What is the best crimping iron? Whether you’re looking for a throwback 80s look, a way to build a ton of volume without using a lot of styling products, or an easy way to get natural looking beach waves, there’s a crimping iron out there for you. Crimping irons have become a very versatile hair styling tool and are designed to help you get the look you want without spending too much time in front of the mirror. They’re fast, effective, and work with a wide range of hair textures. 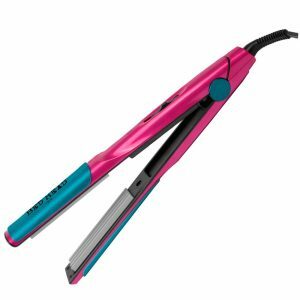 Let’s take a look at some of the best crimping irons available. The Bed Head Totally Bent Chrome Crimper is an easy way to add interest and texture to your hair. It leaves you with a classic throwback 80s style while letting you have the freedom to create your own individual style. The wide 2 inch plates help you crimp large sections of hair quickly, reducing the amount of time you’ll spend fixing your hair. If you have thick hair, this is a great choice because smaller plates would take twice as long if you want to crimp all of your hair. Don’t want a look that drastic? Simply use smaller sections of hair and choose a few strands of hair to crimp for a one of a kind look. This crimper heats up in roughly a minute. Variable heat settings mean you can use it on a variety of hair textures. Hotter temperatures that are needed for thick hair could burn or damage thin hair. Having variable heat setting makes this a crimper that anyone can use. It also comes with a Flexi-cord for easy movements so nothing gets in the way of crimping your hair. It also just has a funky look to it, with a bright blue/green metallic finish that includes finger grips so you can get the right hold on your hair. The Totally Bent Chrome Crimper looks funky and will help you create a cool, funky look for yourself. 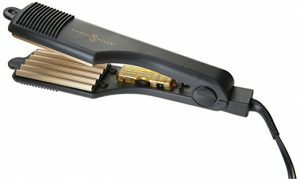 The Gold N Hot crimper works with a wide variety of hair textures. The temperature dial is adjustable and covers a wide range so you can use this crimper whether you have hair that’s thin and easier to style or thick and harder to tame. The gold toned crimping plate has a classy look while being able to maintain and hold even heat to make sure your hair gets a uniform crimpy pattern. 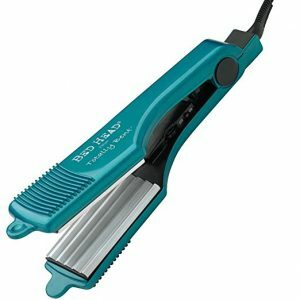 If you’re looking for a way to create dramatic texture and a lot of volume, this is a great crimper to choose. It’s user friendly and really easy to use. The power indicator lights tells you when it’s on and ready to go. The professional grade swivel cord lets you use the tool without having to worry about the cord getting in the way. It heats up in under 2 minutes and the 2 inch barrel covers a larger section of hair so you can crimp your whole head without spending too much time in front of the mirror. Make sure to use a heat setting that’s appropriate for your hair. Typically, the finer your hair is, the lower the temperature should be. It’s best to start on a low setting and slowly increase the temperature until you find the right one for your hair. This is important with all crimpers, but the Gold N’ Hot crimper has been known to burn hair when used at a temperature that’s too high. If you’re looking for body and volume without actually wearing a crimped style, this is the one for you. This crimper has small, one inch rippled plates that are meant to help you build volume. This isn’t a crimper that’s meant to be used on your whole head. The idea is to use it at your roots and underneath the surface of the hair. The textured, crimped sections lift the rest of your hair, lifting it and adding volume. You may not even need to use any styling products. The plates are made using tourmaline ceramic technology, which helps reduce frizz and creates massive shine. They heat up to about 400 degrees F, plenty of heat for hard to style hair. 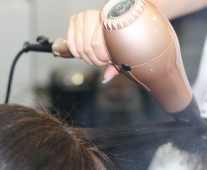 The temperature adjustment allows you to set it to low, medium, or high heat so if you have thin hair and need a little less heat, you can easily change the settings. The cord is 6 feet long so you have plenty of room to work without worrying about staying right next to an outlet. Because the ceramic plates keep your hair from frizzing, the crimped sections stay concealed underneath the top layers of your hair so you get great volume without anyone being able to see the textured parts. People will want to know what product you started using to get the amount of volume this crimper will deliver. You can tell them, you’re essentially styling product free. It’s all about finding the right tool. And for big volume, the right tool is definitely the Bed Head Little Tease Hair Crimper. It’s not always easy getting perfect beach waves but the Bed Head Wave Artist Deep Waver delivers them with minimal fuss. This crimper doesn’t look like a typical crimper. Instead of sharp angles, it’s shaped like smooth, curvy waves. Use it the same way as a crimper, pressing the waves into your hair and repeating the pattern from end to end, all over you head. The tourmaline ceramic plates not only hold and disperse heat evenly, they also form shinier, softer waves with minimal frizz. The heat dial has multiple settings and heats up to a high temperature of 400 degrees so it works with hair of many textures and thicknesses. The tangle free swivel cord prevents it from getting in the way while you’re working and lets you store it without worrying about the cord getting tangled. There’s also a plate locking switch so you can keep the crimper closed when you put it away. Washing and drying are the foundations of good hair styling. You should also take a look at our recommendations for Korean shampoos as well as our suggestions for a hooded hair dryer.